The animated and truly original sketch filter app. - Style browser with 160 wildly different presets. - Animated beautiful sketch drawing, stroke by stroke. 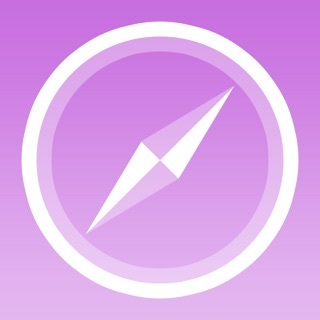 - Use directly within the Photos app. - Unique effects unachievable with any other app. - Easily rearrange, add, delete or tweak presets. - Shares core algorithms with the $40 Mac version. 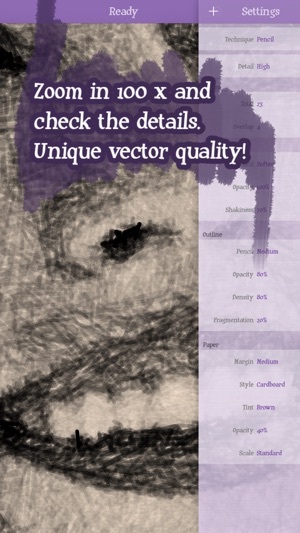 - Vector quality sketches: zoom deep with a perfectly crisp view. - Save sharp sketches up to 8 megapixels, regardless of input image size. - Optional PDF upgrade to save vector sketches. Massively powerful for pro users! - Reached #1 paid ipad photo app in US and many other countries, at $4.99. - App Store feature many times: "New and Noteworthy", "Staff Favorites", "What's Hot", and "Impress Your Friends". - Best of all: used by professional artists around the world, and in art classes. Studio Mee creates high quality software for producing art from photos. 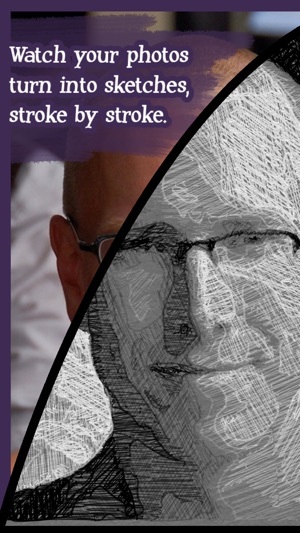 This new version of SketchMee produces fascinating results. 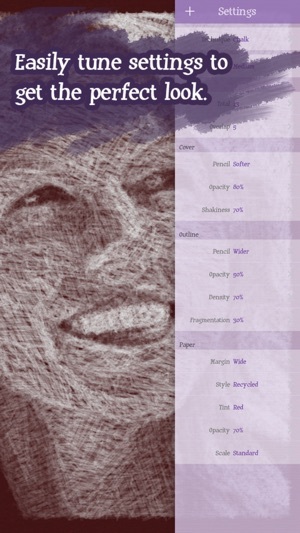 They have an algorithmic look, not quite like a natural drawing, but interesting nonetheless. The potential for an artist would be to blend the results from SketchMee with their own hand drawn layers, photos or other effects. 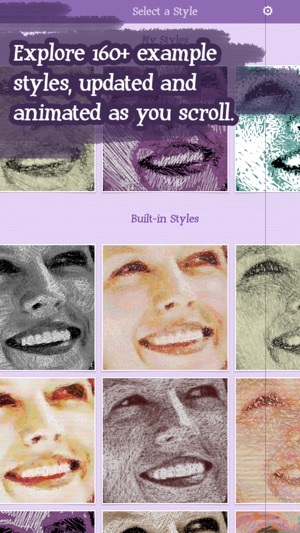 The app comes with over 150 presets that reinterpret your input image with line fills and contours. The settings can be tuned to unlimited variations. The output quality on an iPad is high, up to 8 megapixels, and there is an in-app option for vector output for those who want to take their pictures further. 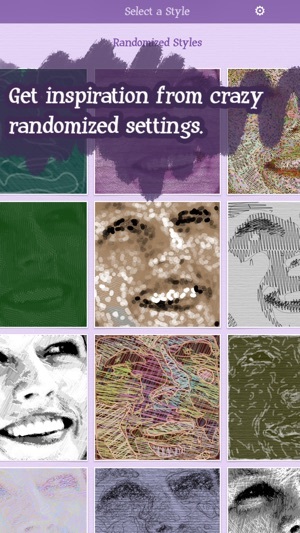 Even if you don't intend to do that, the app is highly entertaining. Ok. More specifically. All kinds of things happen after you find your way through the model T clunk a dunk interface to add your photo then for some unknown reason it forces you to isolate a face using one of only three aspect ratios. Why a face? Who knows? Why those aspect ratios? Who knows? Moving on... then we get to the smorgasbord main stage chaos zone where scribbles occur over your previously selected face. You engage a menu with a dozen parameters which contain (you guessed it) a bunch of options that only the almighty allah god spirit wandering goat monkey and the hans solo developer understands the meaning of. You blindly stab around making changes but no sense as to what on earth is going on. Then abandon said efforts. Hunt around the App Store to find the place to light this app and thus brings us to the current moment in time. I would give this more than 5 stars if I could... I recommend this to everybody!!!! A great app!!! I had to tear myself away from it just to write the review.